Tip the flour into the mixer bowl; add salt, butter and the cold water and beat until the mixture becomes like wet sand. Then roll out the dough with a rolling pin and lay it across a buttered flan tin. 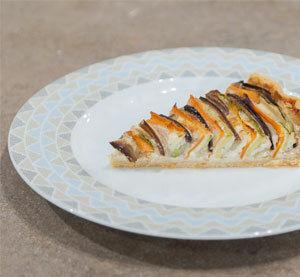 Slice the courgettes, the carrot and the aubergine in fine slices lengthwise and put them in a bowl. Add the BBQ balsamic cream, salt and pepper and allow them to marinate. In another bowl, put the cheeses (grated parmesan, grated hard cheese, light cream cheese), the heavy cream, paprika, salt, pepper and the eggs and mix well. Spread the cheese mixture evenly on the pastry. Starting from outer edge of the flan tin, start laying the vegetable slices vertically so the bottom side of each slice is dipped into the cheese mixture and work around the perimeter in concentric circles (alternating between eggplant, zucchini and carrot), until you reach the center of the tart. Drizzle with olive oil, sprinkle with grated parmesan cheese and bake in a preheated oven at 180oC for about 50 minutes.